Did you know YaHuWaH forbid the eating of swines flesh? They that sanctify themselves, and purify themselves in the gardens behind one tree in the midst, eating swine's flesh, and the abomination, and the mouse, shall be consumed together, saith YHWH. Have you heard the saying “You are what you eat”. It’s obvious; everything that we put into our body affects us either in a good or bad way; negatively or positively. Our body needs all the essential vitamins, nutrients and minerals in order for it to function properly; and from a health point of view, a swine or a pig is the most impure animal to consume. YaHuWaH made this creature and yet he forbid us to eat it, so there must be a reason. This has not stopped the Christians despite knowing the major issues that are associated with the consumption of this meat. Pigs are scavengers, they eat scraps and they are omnivorous animals. They eat anything even their own and even human carcasses. They are the dirtiest animals and even they eat their own feces. Biologically speaking, pigs are similar to humans and pig’s meat is believed to be the tastiest of all like human flesh. In fact, pigs have been used for dissection and study in science classes (Biology & Toxicology), mainly because of its similarity with human body from the skin to its internal organs. Pigs have no sweat glands and thus, they are prone to disease. Unlike other mammals, a pig does not sweat or perspire. Perspiration is a means by which toxins are removed from the body. Since a pig does not sweat, the toxins remain within its body and in the meat. They have no other way of getting rid of their toxins but through waste excretion. Pigs eat anything including urine, their own feces, other animal excrement's, dirt, decaying animal flesh, maggots, or decaying vegetables; they will even eat the cancerous growths off other pigs or animals. So, when you eat pork, you are also getting all those toxins that are in the pig. These contaminated products can harvest parasites and these parasites can be transmitted to those who eat the pig’s flesh-pork. The meat and fat of a pig absorbs toxins like a sponge and their meat can be 30 times more toxic than beef or venison. Unlike other animal manure, a pig’s feces can’t be used for gardening because of its toxins. This clearly explains that pig is so dirty, so gross and a valid reason enough not to eat it. Accordingly, pig carries more than a hundred viruses, which are evidently harmful to us-humans. Take for instance the case of H1N1 better known as the “swine flu”. H1N1 is a virus obviously transmitted from the pig and is fatal. However, this is not the only disease that you can get from eating pork. According to medical research, the fat content in pork is more than any other meat like beef, mutton, etc and it takes longer to digest. When eating beef or venison, it takes 8 to 9 hours to digest the meat so what little toxins are in the meat are slowly put into our system and can be filtered by the liver. When pork is eaten, it takes only 4 hours to digest the meat. We thus get a much higher level of toxins within a shorter time. Raw food, or other healthy foods take up to only half that time to digest. This means it takes such a long time to digest it that toxins are running through your bloodstreams before you can even get rid of it. Cows have a complex digestive system, having four stomachs. It thus takes over 24 hours to digest their vegetarian diet causing its food to be purified of toxins. In contrast, the swine’s one stomach takes only about 4 hours to digest its foul diet, turning its toxic food into flesh. The swine carries about 30 diseases which can be easily passed to humans. This is why YaHuWaH commanded that we are not even to touch their carcass (Leviticus 11:8). Did you know that pork carries a variety of parasites? Some of these parasites don’t die even when cooking. Thus, the danger of eating under cooked pork. 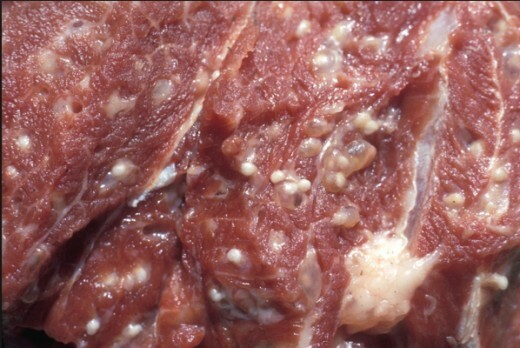 Trichinellosis or Trichinosis – this is an infection that humans get from consuming under cooked or uncooked pork meat, which contains the larvae of the trichinella worm. This worm parasite (very commonly found in pork) most often lives in cysts in the stomach, opens through stomach acids, and its larvae are released into the body of the pig. These worms navigate everywhere in the body of the pig especially in the muscles of the pig, in which you eat. And so, from the body of the pig to yours—the unknowing human body that eats the infected pork. Bear in mind that trichinellosis is a serious illness and you definitely don’t want that. 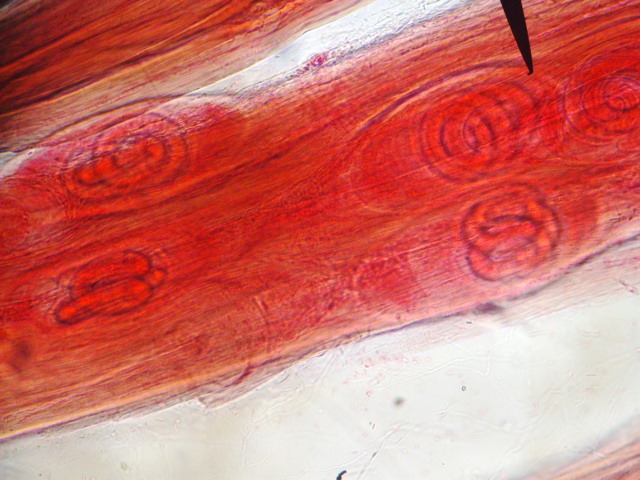 The trichinae worm of the swine is microscopically small, and once ingested can lodge itself in our intestines, muscles, spinal cord or the brain. This results in the disease trichinosis. The symptoms are sometimes lacking, but when present they are mistaken for other diseases, such as typhoid, arthritis, rheumatism, gastritis, MS, meningitis, gall bladder trouble, or acute alcoholism. Another thing to not is that when a pig is butchered, worms and insects take to its flesh sooner and faster than to other animal’s flesh. In a few days the swine flesh is full of worms. Swine and pigs have over a dozen parasites within them, such as tapeworms, flukes, worms, and trichinae. There is no safe temperature at which pork can be cooked to ensure that all these parasites, their cysts, and eggs will be killed. Slaves often had to feed their families with less desirable ingredients, and they took those scraps and turned them into the “delicacies” people now know as soul food. Slaves were forced to eat the animal parts their Christian masters threw away. They cleaned and cooked pig intestines and called them "chitterlings." They took the butts of oxen and christened them "ox tails." Same thing for pigs' tails, pigs' feet, chicken necks, smoked neck bones, hog jowls and gizzards. Today, all of those parts -- including smoked neck bones, ham hocks, bacon, fat back and salt pork -- are still included in soul food menus, either as main dishes or to flavor foods such as vegetables and dried beans and peas. Soul food (renamed slave food) has been killing black folks ever since slavery. So many Negros today have been conditioned to believe that their slave food is a delicacy. Its such a shame that so many blacks / melanated people proudly kill themselves because they choose to keep tradition and refuse to educate themselves on their true ABaRiY history. The pig is so poisonous and filthy, that YaHuWaH gave the pig a sewer line or canal running down each leg with an outlet in the bottom of the foot. Out of this hole oozes pus and filth its body cannot pass into its system fast enough. Most of this pus gets into the meat of the pig. This pus is the reason why pigs feet are so sticky when cooked. According to ABaRiY (aka Hebrew) culture, pork is one of a number of foods forbidden for consumption. These foods are known as “non-kosher” foods. In order for a meat to be kosher, it must first come from a kosher animal. A kosher animal must have split hooves – therefore cows, sheep, goats and deer are all kosher, whereas camels and pigs are not kosher (Leviticus 11). Pigs were not in the so-called “New World,” later called the Americas; until they were brought here by the people from Europe. All the wild pigs, we now see in the Americas; are descendants of the domestic pigs brought from Europe. The majority of Native Americans in the USA, never ate pork until, it was fed to them while they were confined in the reservation / concentration camps. Their movement was restricted and they were prevented from hunting and fishing for the food that their ancestors used to eat. Between forced removals of tribal nations from their historic homelands to concentration-camp-style reservations and the introduction of processed foods to replace traditional diets, farming and ranching have been almost eradicated from Native American practices. During the times of American slavery regarding the Negros, the slave’s daily food was so bad that they looked forward to the times when they were given pork to eat. Their hunger was so great that they ate every part of the pig, including the intestines (now called chitterlings or chitlins), which were saturated with feces. The very first thing that Malcolm X did on his path of self-awareness, was to stop eating pork (read The Autobiography of Malcolm X). We DON'T believe that eating swine in ignorance (Acts 17:30) is a heaven or the lake of fire issue, but once someone KNOWS that YHWH forbids eating this animal and then makes the conscious choice to do so anyway, this is ultimately showing their true hearts intent. We understand their is an emotional process or attachment that takes time to break (due to the conditioning. but we all have to answer to YaHuWaH through His son YaHuWShuWA for our actions. People are so quick to forget that this is NOT about them or THIER wants. People are free to feed their bodies whatever they want, but they must ALSO be ready to reap the consequences when they have major health issues later in their lives. Making the choice to stop eating swine comes with the maturing of the RuWaCh. If its a REAL struggle to give up something that YaHuWaH clearly doesn't want His QaDaSh people to eat or do, then this is an indication of a deeper issue. YaHuWaH's truth is the ultimate lie detector and its specifically designed to expose your true LaBaB (H3824 heart / mind). If someone says they love the Creator but their actions or fruits show that obeying YHWH is extremely difficult, then the issue is THAT person and whats more important to THEM! YaHuWShuWA horrifically gave up his life on the tree so that YaHuWaH's elect (NOT the masses who DON'T care to obey) could have a way back to the Creator YaHuWaH. How is it that people make such a big deal about giving up a food that 1) was NEVER created for consumption and 2) kills their body? Do people really want to eat an animal that YaHuWShuWA cast demons into (MaTaThiYaHuW 8:28-34 "Matthew" and Luke 8:26-37)! When one truly and fully loves YaHuWaH, their RuWaCh (spirit) and LaBaB naturally wants to please Him, hence they make REAL changes in their life. YaHuWaH has given us one temple and we are to keep it clean if we desire the set apart RuWaCh to dwell in us. People often misread 1 Timothy 4:1-4 saying that ALL food (NO matter if YaHuWaH forbid it or not) is now OK to eat. Scripture is very clear that YaHuWaH DOES NOT change, so this means its people how have changed or compromised. If something was an abomination to YaHuWaH back then, then its STILL an abomination NOW (MaLAkiY 3:6 “Malachi”). What ShauWL (translated to Paul in English) is talking about in 1 Timothy was the CLEAN food that YaHuWaH said we ARE to eat. If you notice in verses 1-3, people were spreading false doctrines saying ALL meats were bad. We also have to remember that the letter was from ShauWL to Timothy, and in the ABaRiY culture (and those who walked in the truth back then) they DIDN’T eat swine, so ShauWL wouldn’t have told Timothy not to eat pig or unclean animals (because he already knew this). When ShauWL said "good" he meant ALL the clean animals YaHuWaH meant for consumption ("good" as in its proper place), and good for the purpose for which YaHuWaH made it (Leviticus 11). Just because YaHuWaH created some animals that are poisonous in nature, DOSE NOT mean its good for food, even if you pray for it (MaTaThiYaHuW 4:7 "Matthew" and DaBaRiYM 6:16 "Deuteronomy"). If you pray over a serving of poison from a Dart Frog (the most toxic on the planet), then drink it, you will surly die! Scripture says we are NOT to tempt or test YaHuWaH (Luke 4:12, MaTaThiYaHuW 4:7 "Matthew" and Psalm 78:18). ALL animals are good only in its place and for the purpose in which YaHuWaH intended it. If mankind obeyed how YaHuWaH intended the animals to be used originally, animals would be used or consumed properly without injury to mankind. Every creature which YaHuWaH has made for man's nourishment is good for that purpose, and all animal that are NOT OK to eat and good for the purpose YaHuWaH make it for. We are to give YaDaH (thanks to YaHuWaH) for food that is necessary to support human life. Again this ALL comes down to your maturity in the RuWaCh, there is NOTHING wrong with YaHuWaH's commandments, whats wrong is peoples OWN selfish righteousness or hearts intent (YaShAYaHuW 64:4-7 "Isaiah"). People love to say its all about their heart but scripture reminds us that not only is our heart wicked but its the most deceitful thing about us (YaRaMiYaHuW 17:9 "Jeremiah")! Apostle Bennett (from ShaluwmYaH) beautifully touches on eating the abomination, swines flesh! Sadly so many people have health and obesity issues because they CAN’T give up self or the traditions their ancestors learned due to Christian slave masters! Apostle Bennett (from ShaluwmYaH) teaches a VERY powerful message (The Table of YaHuWaH) regarding nourishment in the RuWaCh. If you're standing strong and being conscious of what your feeding your inner man (eating from various tables spiritually), you will fall for everything!